Swimsuit season is here, as all the magazines have already reminded you, and that means it’s time to crank up your routine! 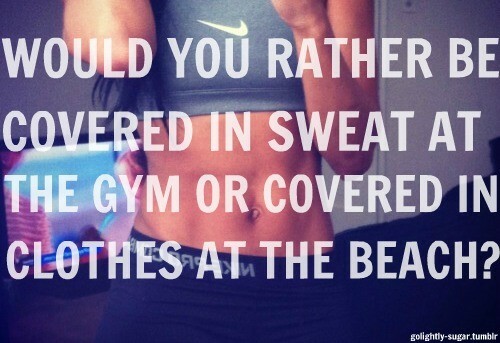 You can exercise your heart out, but eating clean is so important to get you into that swimsuit. Not downgrading exercise, because they both work together, in correspondence. Eating a well balanced breakfast within 90 minutes of waking up is so important. I have tons of breakfast recipes that you might love! Aim for your meals to be Lean, Clean & Green to get the results you want. This means tons of veggies, fresh fruits, lean protein and healthy fats! Eliminate processed foods and stick to whole, real nutritious foods. Always drink 8-14 eight oz glasses of water a day: the more the better! Water helps your skin glow, keeps you awake and alert, metabolizes your body, flushes toxins, and so much more! Did you know the average persons water content in there body is 50-75%? Sometimes you think your hungry but you’re actually dehydrated. Eating LC&G at dinner is so important because you will not be burning off the carbohydrates you eat like you would be for breakfast or lunch! Aim for lean protein and vegetables at this meal. Dessert is OK. Have a square or two of 75% or more dark chocolate to curb your cravings! Cardio is important to shed the fat, but in order to have lean muscle, you need to be doing strength exercise. And don’t worry ladies: weights do NOT bulk you! It create lean, toned muscle. Aim to workout 4-6 days a week, incorporating both cardio and strength. Strength does not have to mean the weight room necessarily, body weight exercise routines are great! For cardio, it doesn’t have to be one hour on the elliptical, 15-30 minute HIIT seasons get the job done! Motivation helps drive that goal of yours! Find a picture, a quote, music, accountability buddy, really anything that will help you with your goals! Questions? Shoot me a comment and I would love to get back to you! Hi Claire; love your blog! Do you have time tonight or tomorrow for an informal interview? I work with Mark F, and am doing some social research that I’d like your input on. Thank you so much for the opportunity, that would be amazing! I am assuming it would be online? what kind of exercise should we do? besides lifting weights? weight resistance and cardio, but make it FUN!